With over 20 years’ experience in producing paper products such as pop up books, brochures, packaging and sculptures to name a few, cardboard engineers, Papersmyths, who have worked with clients such as Harrods, Puffin Books and Nespresso, chose Mirri to add the finishing touch to their 2017 Christmas card. With their take on a Christmas carol favourite, ‘The Twelve Days of Christmas’, Mirri was used to create the gift in verse five – Five Gold Rings. The design sees a frame to the front embellished with laser cut hearts and stars out of 250g Edixion Offset card. 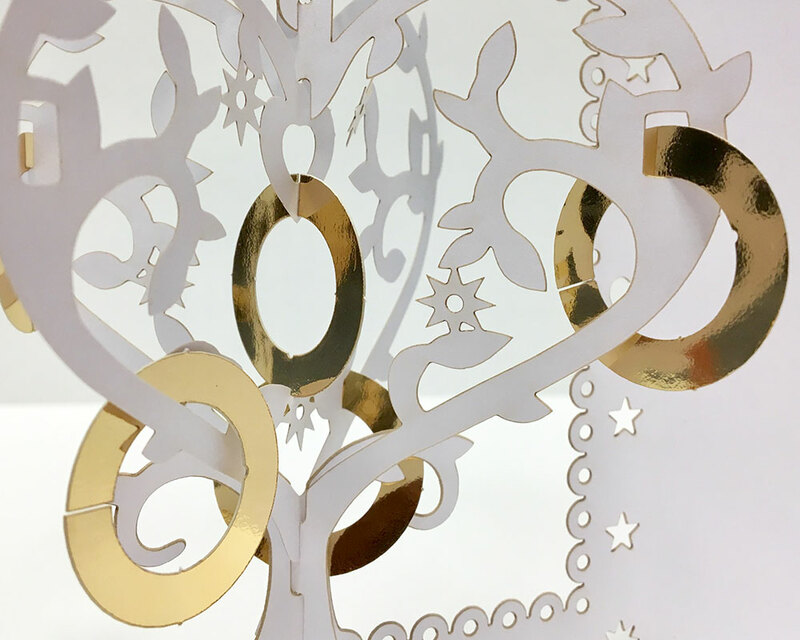 Sat in the frame is a laser cut pop up tree made from two additional pieces of card, slotted together by hand. When the card is opened, the tree takes on its three-dimensional form. Hanging from the branches are five gold rings. These have been laser cut out of Mirri Duo Gold. Our Mirri Duo product is reflective on both sides, which was ideal for this design as the rings can be seen from all angles once the card is opened. With a slight breeze, the tree moves about and allows the reflective Mirri to shine whenever the light hits it. On the inside, the message ‘Season’s Greetings’ has been laser cut out in the centre. Mirri Duo is available off-the-shelf in gold and silver, however bespoke makes can be produced, subject to quantity, using other finishes. You can even select two different films to make each side different and unique. For more information on Mirri products, please contact the Mirri team on: 0118 930 3656 or email: mirri@celloglas.co.uk.